Flickr, Picasa and loving your photos! This is a joint post between Chris Betcher and myself on Flickr and Picasa, and has been cross posted on each of our blogs. Please note that we had written different sections and apologies but “I” may mean Chris or me (Sue). After spending some time yesterday migrating Linda’s (Chris’s girlfriend) entire photo collection (well, most of it… did I mention that regular backup is very important?) into Google’s Picasa photo management application and then giving her a bit of a tutorial in how to use it tonight, she asked the next obvious question… how do I put some of these photos onto Flickr? A good question. After all, Flickr is without a doubt the best online photo sharing website around. With amazing tools and options, an incredible online community for sharing and learning from each other, and a huge array of APIs that enable Flickr to work with a range of different online and offline services, the decision to use Flickr as your online photo storage tool of choice is a bit of a no-brainer. It is definitely beneficial to import photos from your camera directly into Picasa because it means you don’t import multiple copies of the same photo. Besides learning a lot more about Picasa it has been amazing collaborating writing a post; using Google Documents, Twitter and Skype — and Chris has a great writing style (jealous!!!). Chris and I would love to learn more about how you manage your photos. Please take this opportunity to drop past Chris’s post and leave some tips for him as well. Thanks for writing this post! I use Picasa a bit, but by the sounds of it I should get to know it much better. I don’t really use flickr much – having become very used to photobucket, but I think I may have to swap over seeing as most people I know use Flickr. Well, I’m new to your blog so I’m going to have a good look around now – have heard about you from Chris B and Jo Mc. Wow! Thanks Sue and Chris -this is great and so timely as I can now have time to look and the associated tools and have linked in a whole lot of contacts on my flickr site, which I hadn’t been sure about using up till now. Ah, the power of the network! Sitting back watching the chat happen yesterday was amazing. My husband came in and I was finally able to explain how awesome twitter is – actually snitter is best as Sue has found from her earlier posts. Thanks for the help!! Hi Jess – I definitely know quite a few people who use Picasa but I will need to fiddle with it for a few days to way up the pros and cons. There are pros and cons with Photobucket but at the moment the 3rd party applications that link into Flickr are what makes the difference for me and the community aspect. If you do change to Flickr definitely worth grabbing the Pro account – only $25 per year. Hi Sujokat thanks for inspiring us to jointly investigate Flickr and Picasa; then collaboratively write this post together. We both gained so much from the experience; more than just learning about photo management and sharing. But also differences in writing styles, post layout, using Google Documents and working collaboratively. Um, well basically I don’t manage my photos online – I put them all into iphoto and then randomly put them into picassa/flickr or wherever I get around to – I am probably not a good example, as this is how I manage most of my online resources – anarchically – I do like picassa, but personally I’d like something that reminded me, gently at first and then more persuasively that it was time to get off my but and organise my online life…… and then did it for me. 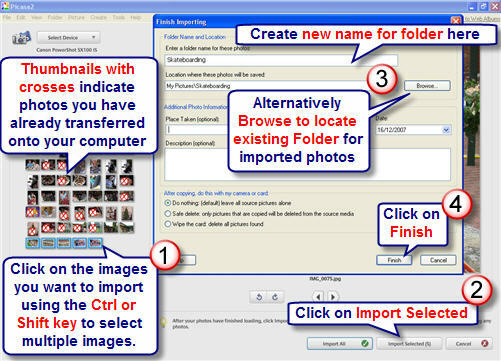 I use Picassa to organize and edit my photos on my hard drive. I use the Flickr Uploader with my Flickr Pro account to back up and share my photos. You need a pro account to store/download the photos at their original file size. Plus, with a pro account you don’t have the upload/bandwidth limitations. This is working for me. Great post. Pingback: RealTime - Questions: "The photosharing website which is best for me?"